I usually draw my Chelsea coverage to a close at the same time the show ends, partly through fatigue, and partly because there are other subjects about which to write at this busy time of the year. The downside is that this deprives many gardens I enjoyed of description and praise. 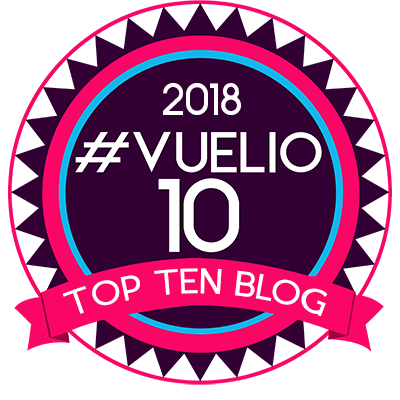 They do, of course, receive plenty of recognition by other means, but when I look back at my blog I am frequently disappointed with myself for not reflecting more thoroughly on gardens that did not reach the very top of my list. Just for this week, and before I become embroiled in Chatsworth, I am going to share a few more Chelsea gardens that captured my imagination in 2018. Laura Anstiss, proud designer of the garden entitled Laced With Hope, was not going to let me walk past without telling me the story that inspired her. I am so pleased she did. 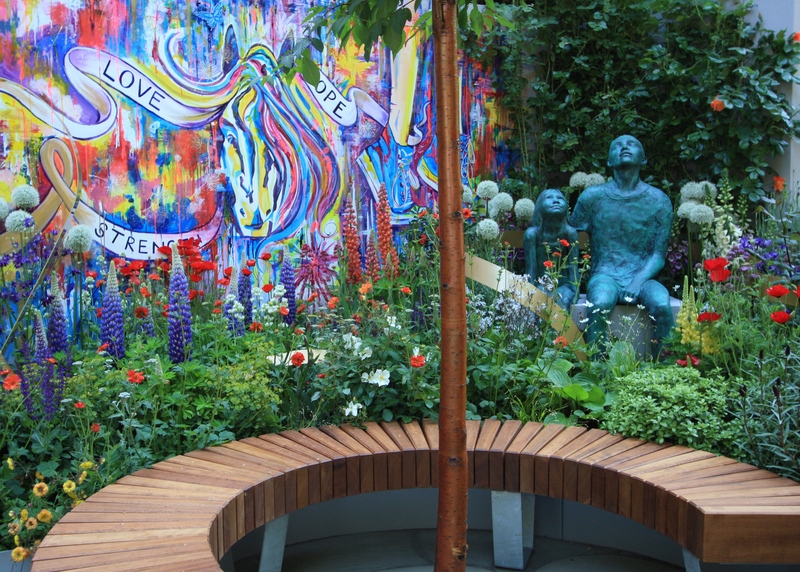 Her vibrant garden is designed to illustrate the path followed by a child who has been diagnosed with cancer. 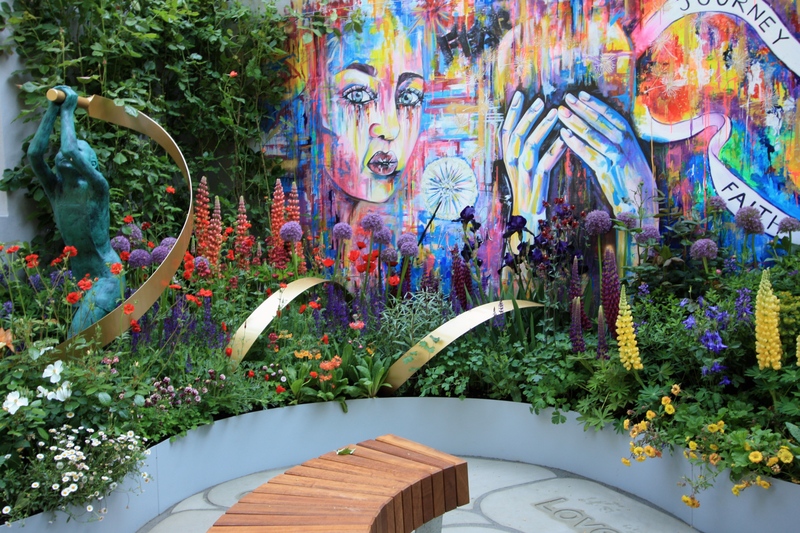 The design describes the emotional rollercoaster experienced by both child and family through the medium of sculpture, art, hard landscaping and planting. It does so vividly, sensitively and without melancholy, every element working together to give meaning. Laura’s verbal interpretation helped me to piece all the component parts together, linked visually by a golden shoelace running playfully through a vibrant planting of alliums, roses, lupins and irises. At one point the giant lace takes the form of the familiar ribbon loop that’s used to create awareness of different forms of cancer. The garden is a collaboration with a charity called Supershoes, an organisation which puts children back in touch with what gives them hope and happiness by commissioning a team of volunteer ‘Super Artists’ to design a pair of customised shoes exclusively for them. The shoes, which might be adorned with images of favourite pets, friends or activities, help to remind the child of their identity and things that bring them joy, whilst they cope with the harsh realities of fighting this pernicious group of diseases. 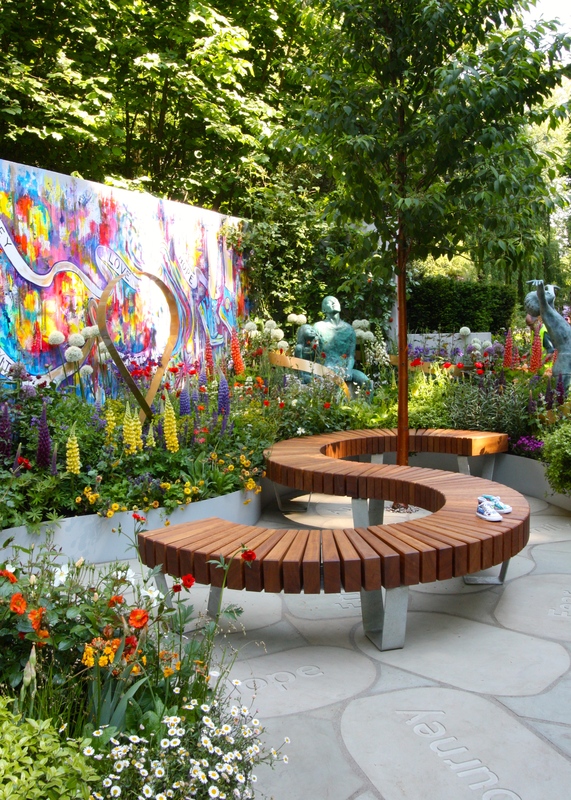 Other protagonists in the creation of this heart-warming garden include Frosts Garden Centres, who provided plants and sponsorship, sculptor Alison Bell and artists Karen Huwen, Alison Bessant and Amanda Sissons. Gardens describing charitable missions, humanitarian disasters and environmental issues are frequently staged at RHS shows. Many succeed in making their point, but few do so without sacrificing something of what’s required to make a genuinely beautiful and appealing garden. In truth I often avoid writing about them so as not to offend when the intent is so positive but the result is confused or unattractive. For me to engage, a garden needs to be visually appealing first and meaningful second. I appreciate others will feel differently on that score, but I’m old-fashioned in that way. 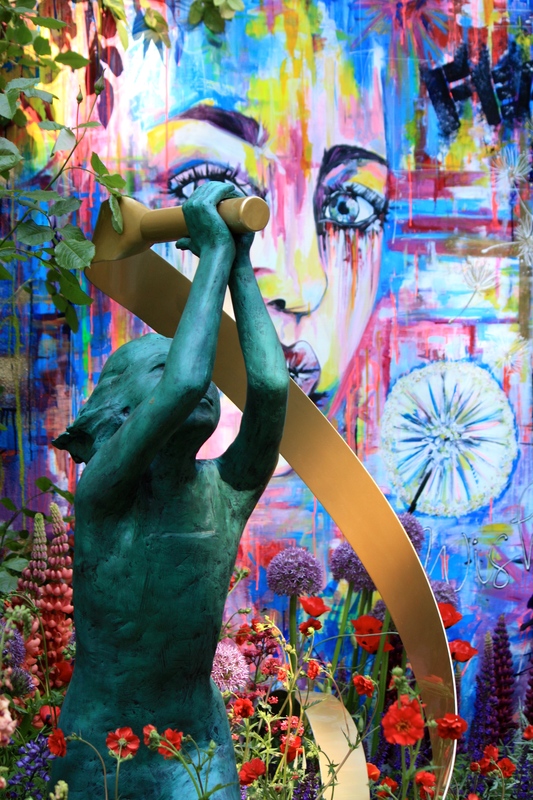 Whilst there was an awful lot going on in Laura’s garden, perhaps too much for some onlookers, once I had heard the story and appreciated the role of the art and sculpture, it all fell into place. I found myself passing by again and again purely to enjoy the colour and energy that flowed out from the space. If I had any criticism it would be that there were one or two elements of storytelling too many, for example a set of words describing the family’s emotional journey cast into paving, which I felt were overkill. It is possible to weigh your garden down with too much meaning, especially when it’s this overt. That minor gripe aside, this was definitely not a garden that sacrificed beauty at the expense of a serious message. Anyone would enjoy sitting here and feel their spirits lifted. 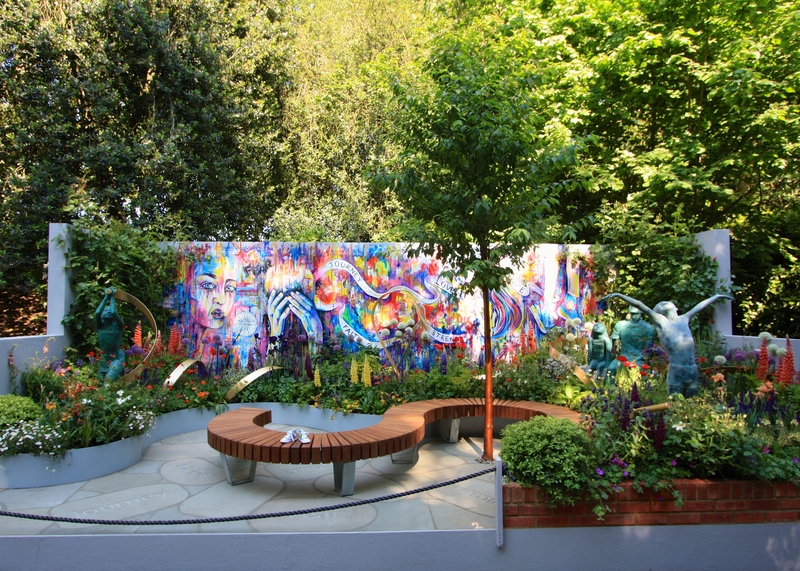 The bright colour palette used throughout became deliciously saturated in the cool shade of the Serpentine Walk and when sunlight filtered through the tree canopy the whole garden came alive. 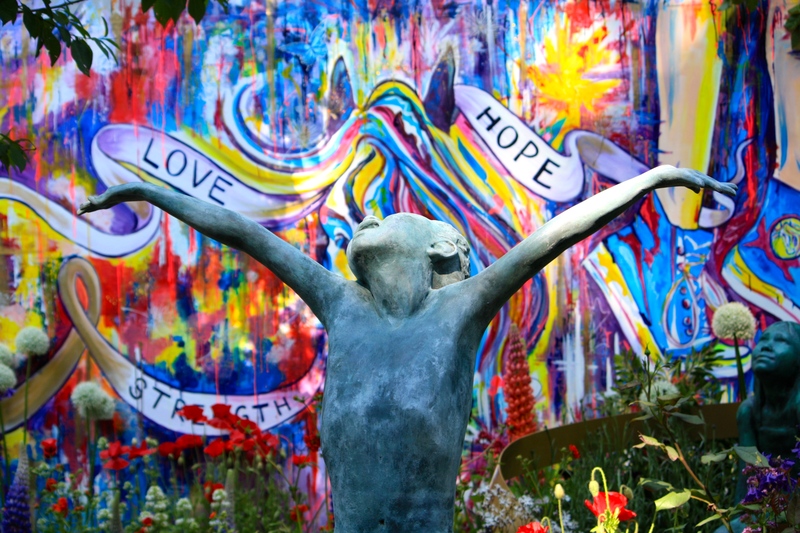 The judges awarded Laced with Hope a silver medal in the Artisan Gardens category. My suspicion is that marks were lost over the planting. Perhaps there was not considered to be enough of it, had the other elements been stripped out, or there was a lack of structure within it. I certainly felt that plants played a supporting role in a garden already rich with alternative narrative elements. I will not be the only Chelsea visitor to be both enlightened and moved by this garden’s unambiguous, focused message. A tiny pair of intricately painted canvas shoes isolated on a curved bench brought home just how small and alone children must feel when diagnosed with cancer. 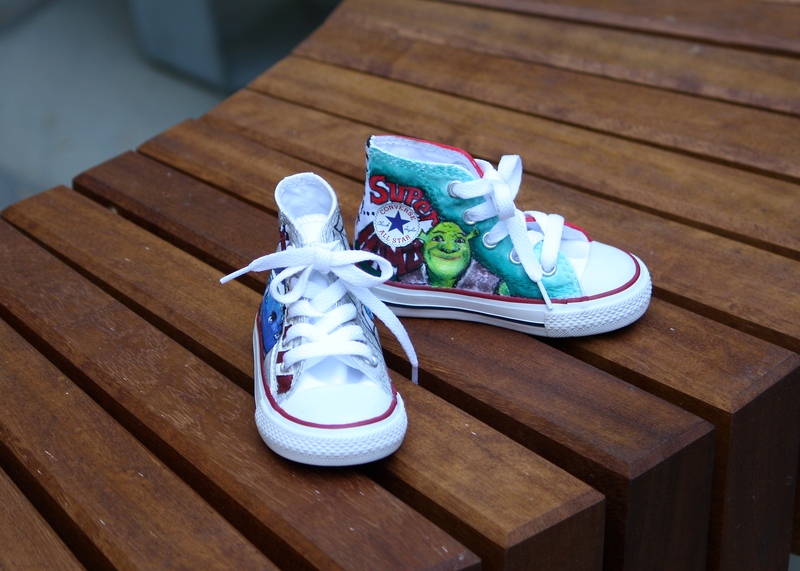 Supershoes help children to re-engage with the things they love, giving them the motivation to see beyond all the tests, scans and treatments they must endure to fight their cancer. In turn this garden helps the viewer to put themselves in their shoes, and their own problems in perspective. TFG. The energy just leaps out of this garden for me. So vibrant – poignant, and yes full of hope. Lovely to have a report on a garden that probably doesn’t get the attention some of the bigger extravaganzas command. Beautiful Dan. Thanks Helen. More space between the Artisan Gardens this year, which helps. They used to be squeezed in very closely. This was definitely a happy space – the team had so much enthusiasm for it. I very much like the way the lupins echo both the colours and the vertical lines in the mural. Yes, attention was certainly paid to matching the planting with the mural. Lupins were everywhere this year. When they invent a snail-proof variety I will think about growing them! Love the shoes (and the colourful garden) despite the serious theme. The last picture goes right to my heart. This garden deserved all the praise it was getting from the public and press alike. It was a magical place….full of positivity and colour…. and ,indeed, laced with hope. Those lupins! Is this is positive garden therapy it certainly succeeds with me. Beautiful.